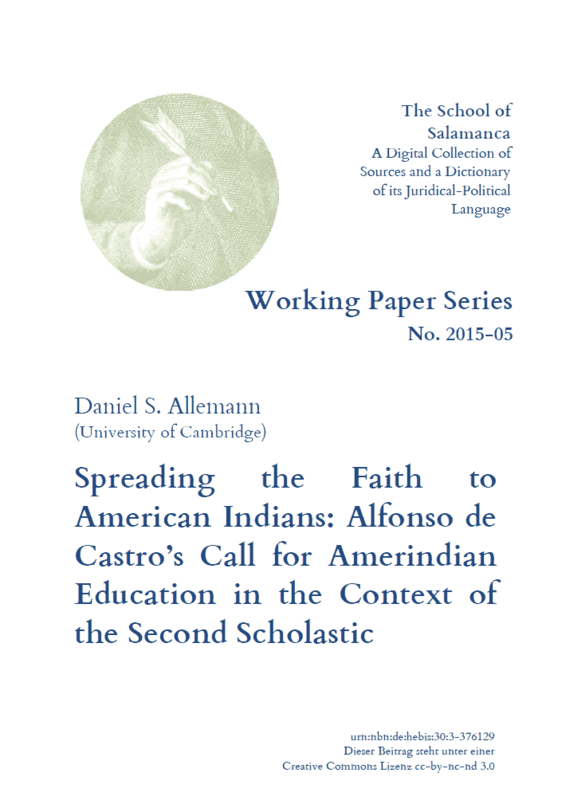 Daniel S. Allemann: Spreading the Faith to American Indians: Alfonso de Castro's Call for Amerindian Education in the Context of the Second Scholastic, SvSal WP No. 2015-05. Historical scholarship on the sixteenth-century neo-scholastic debate about American Indians generally centers on the thought of Francisco de Vitoria. Focusing on Alfonso de Castro's short treatise Utrum indigenae (1543), this paper challenges both an exclusive concentratio on Vitoria as well as the received contention that the thought of the School of Salamanca rendered a single, unified view of Amerindians. In Utrum indigenae, Castro argued that American Indians should be instructed in liberal arts and theology thus constructing a strikingly different image of the peoples of the New World as compared to accounts by Vitoria or Francisco Suárez. While the historian Martin Nesvig has recently proposed an Erasmian humanist contextualization of Castro’s treatise, I argue that the image of American Indians presented in Utrum indigenae testifies to an alternative, novel way of writing about American Indians from within the framework of the School of Salamanca which has so far remained unnoticed.